The work package builds on the results of the EV gap analysis of the previous tasks. Existing EV services will be analysed against defined targets and needs with specific focus on cross-domain functionalities of EVs. The data that are used for the retrieval of EVs and SDG indicators (satellite + in-situ) will be evaluated in terms of availability, processing and quality standards regarding needs for estimation and usability. Thereby the WP analysis the potential of current and future sensor and data sources. The work package is structured in the following four tasks. Task 3.1 analysis existing data products and services (e.g. GEOSS, Copernicus and TEP) against defined targets and needs (e.g. for Aichi Biodiversity Targets, FAO Essential Climate Variables (ECVs), for modelling), and highlight opportunities, gaps and limitation for the use of remote sensing products to develop indicators. Based on that results the objective of Task 3.2 is the definition of cross-domain EVs for services and modelling. The WP will identify benefits arising when using EO data beyond domain boundaries and how these benefits be used comprehensively. The cross-domain analyses of data and the identification of new processes as well the extraction of information will become an important issue in the future. In particular, the derivation of inherent cross-domain EVs gathered from the combination of different data source will be defined for services and modelling and therefore the assessment of the GEOSS SBAs. The calibration and validation of observations services (Task 3.3) is essential for the usability of the services. We focus on the analysis of existing in-situ observation standards for validation of EO based products including data quality standards. Especially how to deal with different scales of in-situ data and remote sensing products is one of the main objectives. The aim is to connect in-situ measurements with spaceborne observations with focus on hydrological parameters, soil and vegetation parameters, and biodiversity indicators. 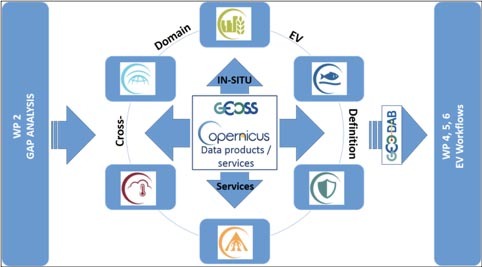 Task 3.4 will evaluate and prepare existing tools and platforms for accessing processed Copernicus data and will analyse the potentials of recent and upcoming Copernicus contributing missions for EV retrieval. Building new services for cross-domain EV requires data access to Copernicus data (Sentinel+in-situ). We will evaluate existing European and national platforms for processing and providing of Sentinel data. Beside documentation of used algorithm and data terms and conditions for data use and access, potential cloud processing and implementation of algorithm for product generation will be investigated. This information provides essential knowledge for the workflows (WP4, 5, 6). Providing case studies and standards for validation of EV service products by combining in-situ reference data with remote sensing data. The work of the WP started in 2018. Currently the team, headed by CREAF, is preparing the overview list of the existing EV service that can be accessed. Based on these result,s the GAP analysis will be finished until end of June 2018. In task 3.2 CNIG presented ideas for a potential methodology to define a set of ‘Essential Land Monitoring variables’. The method combines EVs hat have been established using Copernicus, Sustainable Development Goals (SDG) and United Nations datasets. CNIG has connected the essential Land Monitoring variables with EAGLE model (https://land.copernicus.eu/eagle/welcome). The methodology is foreseen to be validated and supported by users (e.g. United Nations Global Geospatial Information Management – UNGGIM). Task 3.3 and 3.4 will start in June 2018.